We have been on a bit of a health kick recently, cutting out potatoes, pasta, rice, white bread, its amazing how quickly it makes a difference. Of course there are a few things that you miss and pasta happens to be one of them, for a few reasons, including ease of preparing a meal and the various sauces that you can create. I decided that we needed to incorporate a few more vegetables in to our diet too, we are generally quite good, but we needed a concerted effort, well ok, I needed to make a concerted effort as of course it is me who creates, prepares and produces the meals in our house. (My choice, as I always have to be doing something new). I had seen the latest craze with the spiralizers and all the wonderful ‘spaghetti’ that can be made from the various vegetables, so I am on a mission to see how many new recipes I can create using the Cuizique spiralizer. 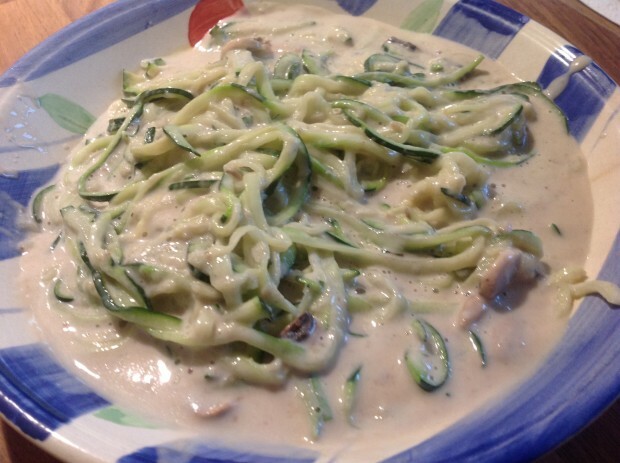 Tonight’s recipe is using courgette (zucchini) , they are great for this as they are usually straight(ish) and easy to whizz through the Cuizique spiralizer. I have used broccoli and celeriac, and I will write up the recipes for them and link them back shortly. 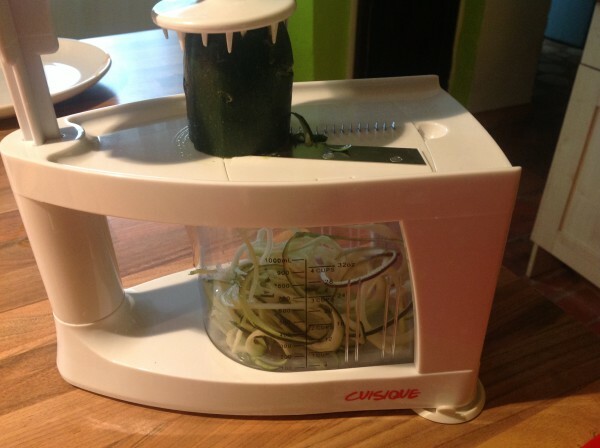 I took 2 large courgettes and whizzed them through the Cuizique spiralizer, this new unit is great as the handle is above the vegetables, pushing them down onto the blades and it only really needs the weight of your hand to push it through the blades and then the cup underneath catches the spaghetti. Its really easy to clean afterwards and all the blades can be stored in the jug for storage. I popped the spaghetti into a large pot filled with salted water, bringing it to the boil and blanched the courgette for 2 minutes, then drained them and left them in the colander until the sauce was ready. 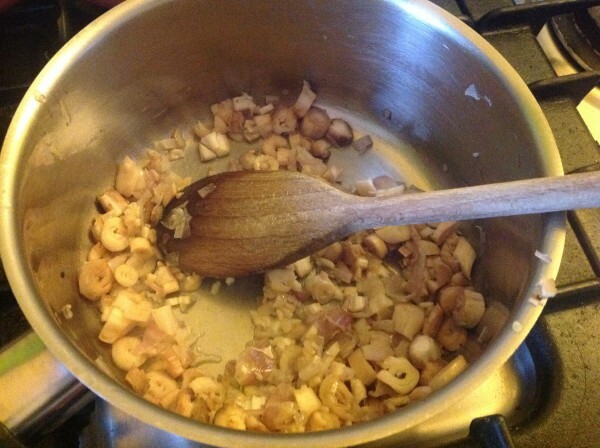 I started on the mushroom sauce, I used the white button (Paris) mushrooms, I know they are not known for their flavour, but I find here (in France) they are great and not over powering, I split the caps from the stocks and cleaned them with a paper towel, NEVER wash mushrooms as they just soak up the dirty water, the best thing to do is to use some kitchen paper or if they are really bad, use a small pastry brush. I roughly chopped the stocks and sliced the mushroom caps. I melted some butter in a medium pot on a low heat, and once melted I added the chopped shallot and cooked until they were soft, but no colour, then I added the crushed garlic and mushroom stocks, and cooked for another 2 minutes. Then I added the white wine and brought it to the boil, letting it boil for 2 minutes, burning off the alcohol, then add then I added the chicken stock and simmered for 5 minutes. I removed the pot from the heat, and using my trusty hand whisk, blitzed the mixture, (of course it did splash a bit, but I just tilted the pot so it wasn’t all over me) until the stock has been pureed, it will be a bit thicker with the shallots and mushroom stocks, I returned the pot to the heat and added the mushroom slices. I gave it a quick mix and allowed the mixture to come back to the boil and simmered it for 5 minutes, before adding the cream, this is always the tense moment to see if the sauce will split, with the hot stock and cold cream, I have found that if you pour the cream in and leave it to stand for about 1 minute it is less likely to split, but if it does, I have a couple of handy tips to bring it back (see tips below) without throwing it away and starting again…. 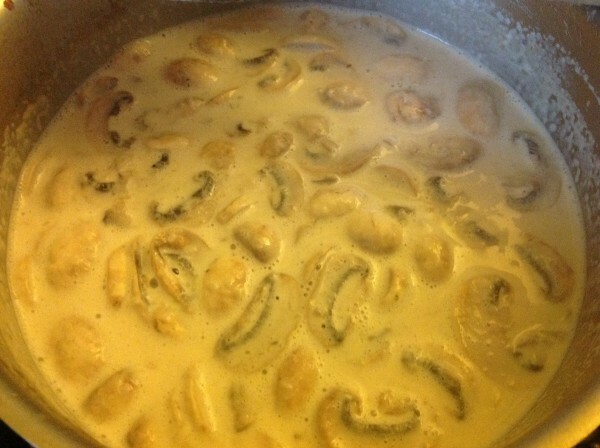 allow the sauce to reduce a little and thicken, taste the sauce to see if you have the flavour (creamy mushroom), if it is still not ‘just’ as you expect, then continue to simmer for another 5 minutes. To serve up, I poured boiling water over the courgette to just refresh it, I added it back into the pot (it was boiled in) and added a couple of spoons of the mushroom mixture and mixed it all through, then using tongs I grabbed a big portion and twisted it around then placed into a bowl, and then it was mushroom sauce time….. mmmm… yummy, I do like this mushroom sauce. This was a great meal, creamy and delicious. 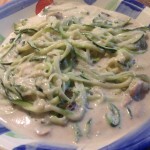 Courgette spaghetti with rich creamy sauce, a great way to get more vegetables into your diet without trying too hard. In addition this is gluten free to as the spaghetti is the thin slices of courgette. Set-up your spiralizer, using the smallest cutter. 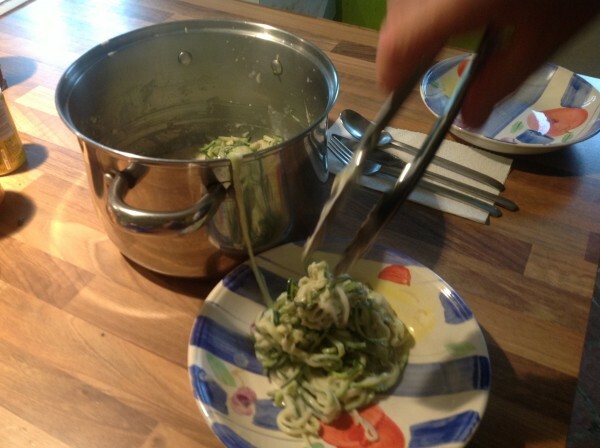 Top and tail your courgettes, and cut in half, just so they are easy to use in the spiralizer. 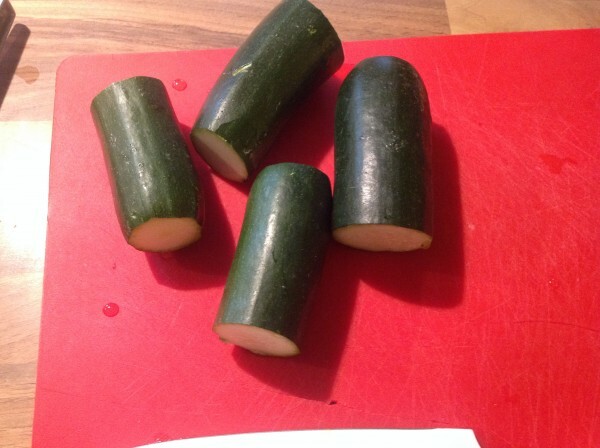 Work your courgettes through the spiralizer and place them in a pot of warm salted water. When ready, place the pot on the heat and bring to the boil. Cook for 2 minutes and then drain in a large colander. 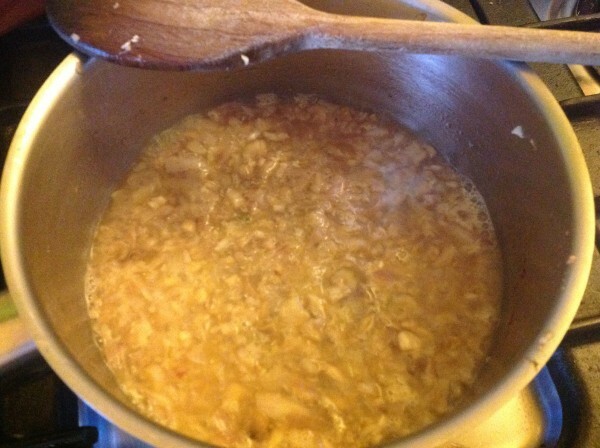 In a medium pot, melt the butter over a low heat and then add the chopped shallots. Mix around to make sure they are all coated in the melted butter. Add the mushroom stocks and crushed garlic and cooked for a further 2 minutes. Pour in the white wine and bring the mixture to the boil for 2 minutes allowing the alcohol to burn off. Add the chicken (or vegetable) stock and boil again for 5 minutes. 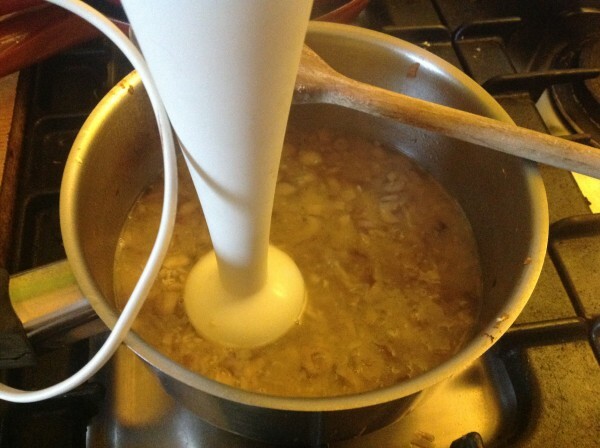 Remove the pot from the heat and using a hand blender, blend the mixture until all the shallots and mushroom stocks are pureed. Return the pot to the heat and add the sliced mushrooms. Simmer for 5 minutes and then add the cream. Leave for 1 minute before stirring, Allow the mixture to come to the boil and simmer for 5 minutes. Taste the sauce and if you have the correct taste, but just not thick enough, mix 1 tsp of cornflour with 3 tsp of cold water and drizzle the mixture into the sauce, stirring all the time, until you have the desired consistency. Pour boiling water over the courgette spaghetti to refresh it, then add back into the large pot and add some of the mushroom sauce, mix it through and then with some tongs, grab some spaghetti and place it in the middle of your bowl, and then pour over some of the sauce. You can substitute vegetable stock instead of the chicken stock to have a completely vegetarian dish. If the sauce is not thick enough add a mixture of cornflour and cold water and add to the simmering sauce, mixing all the time, until you have the desired consistency. 2) A hand blender is great, so if your mushroom sauce slits, remove the mushroom slices out to a bowl, and use the hand blender to whiz everything up, the sauce will come back together and then you can add the mushroom slices back into the sauce and continue to reduce until you have the thickness you want. Reason for removing the mushroom slices, if you don't you will have a mushroom puree, rather than a mushroom sauce. I made this the other day and it was absolutely delicious. I julienned the courgette as I don’t have a spiraliser. It’s a great recipe to have up your sleeve when people come to visit, thank you.